I had been using GoDaddy webmail service for my domain based email server until yesterday. If any of my readers send me a message at admin@corenetworkz.com, I would receive it on GoDaddy webmail. Today noon, I have migrated my webmail server from regular Godaddy webmail to Microsoft Office 365. The migration was not much stressful as I thought. However, I am afraid I lost some emails (fresh emails coming at the time of migration) during conversion time. According to their technical support, it may take up to 48 hours to start receiving emails to Office 365. Anyway, in the end, I am happy with this new product and that is why I am sharing my views with readers. If you don't know what is Office 365 and why do GoDaddy migrated their normal webmail service to this one, I recommend you to continue reading. It is easy to find the login link. all you have to do is to remember the following combination. For example, the login page for the domain name CoreNetworkZ.com is given below. Type the above address and press enter button to see, following screen. Before using it, we need to configure it by simply pressing the button and wait for Microsoft to do it for you. Once the process is done (it may take a few seconds ), you will see the welcome screen. For those who are not familiar with Office applications, it might be a little confusing. One of my friends complained to me after configuring Office 365 for his domain about how to see the webmails send from his contacts. He was not able to see the messages sent from his business contacts after login to his account. Also, it can be misleading while seeing a list of items showing on this page. 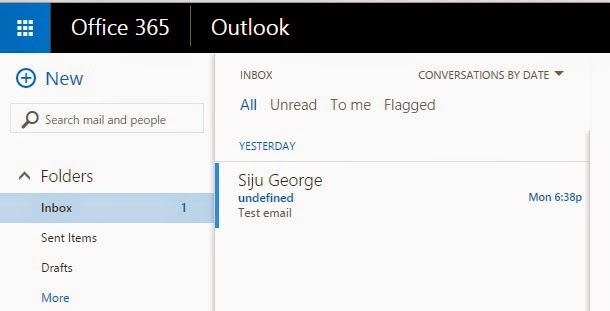 To access the inbox, you should click on Outlook. Here you can see one test message send from another ID. I do not think, anyone has any doubts about the working of this page. Click on the left-hand top to see the menu in case if you want to access any other feature from this page. 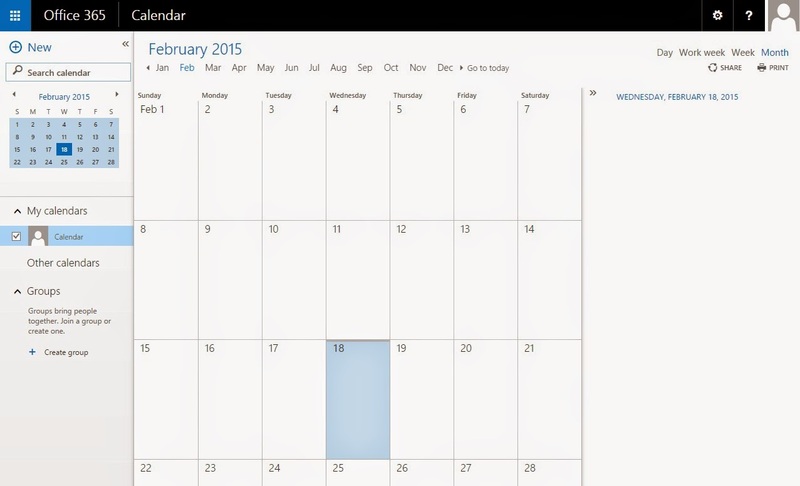 To access Online calendar, click on calendar. You can create a group of similar minded people by clicking 'Create Group' on the left-hand side. You can access the same feature from the 'People' button also. It is easy to change the passwords, subscriptions, users etc from the admin panel. 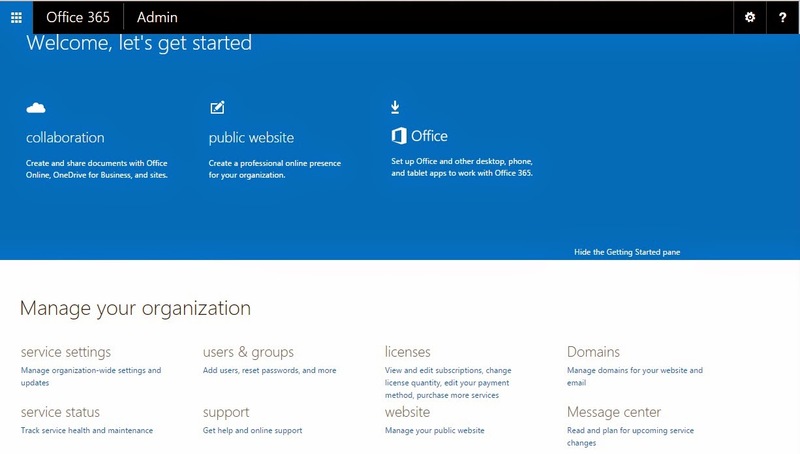 Another method to change password is from Office 365 Settings window. To change the current password, follow the steps below. To store larger files online, you can use 'OneDrive' by clicking 'OneDrive' icon on the main window. Storage space offered by Microsoft varies with plans. If you want to open excel applications one a device where excel is not installed, you would click on 'Excel Online' on the main window.